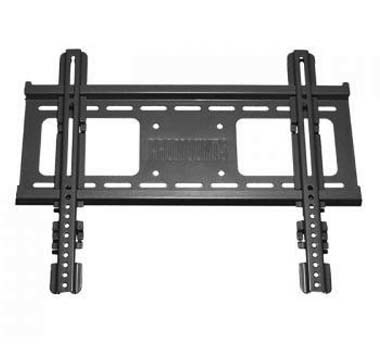 More on the ProMounts Flat Wall Mount for 61-100 inch Screens UF-PRO400 below. A universal, low-profile design, allowing the screen to mounted within 1.5" of the wall and requiring no additional screen adapter plate. A silver or black powdercoat finish. A 400 lb weight capacity. Patent-pending "V-bar" technology, allowing quick and simple vertical/horizontal, post-installation adjustments. 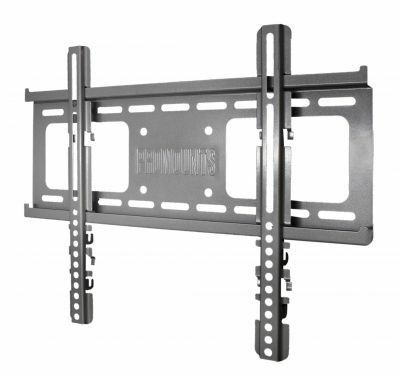 Easy mounting on 3-4 studs (up to 52" apart) and concrete or aggregate walls. All necessary hardware, with the capacity to accept most additional security hardware and padlocks. 61-100" plasma, LCD and DLP flat screens up to 400 pounds. *Also available in tilting/articulating models. See the "Related Products" section, below, for more information. Vertical Hole-Spacing: 2.95 - 28.89"
Horizontal Hole-Spacing: 2.95 - 2.95"